Ribbon: Light green with a red, black and dark green central stripe. Discontinued: 2001 upon formation of the Police Service of Northern Ireland. 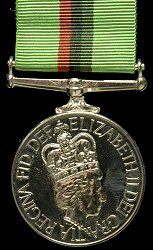 Awarded: For at least 18 months service in the Royal Ulster Constabulary or RUC Reserve.